Pledge on our riders for the tour de Brooklyn! SEE FORMER PRINCIPAL SOLOMON LONG ON TV! We're putting up four farmers markets in June! Pledge on our riders here! See Mr. Long challenge you to bet how how long Mr. Long can go! Help us raise funds for kids and more farmers markets! Here's what biking and playing ball can do! Create FOUR farmers markets in underserved Brooklyn neighborhoods from Prospect Park at Empire Blvd. to Parkside Plaza in Prospect-Lefferts to Crown Heights to Bed-Stuy, maybe more. See details on our flyer here. Our markets feature not fresh produce and activities to build community. EBT/SNAP, WIC, FMNP, Health Bucks accepted. Guess what? 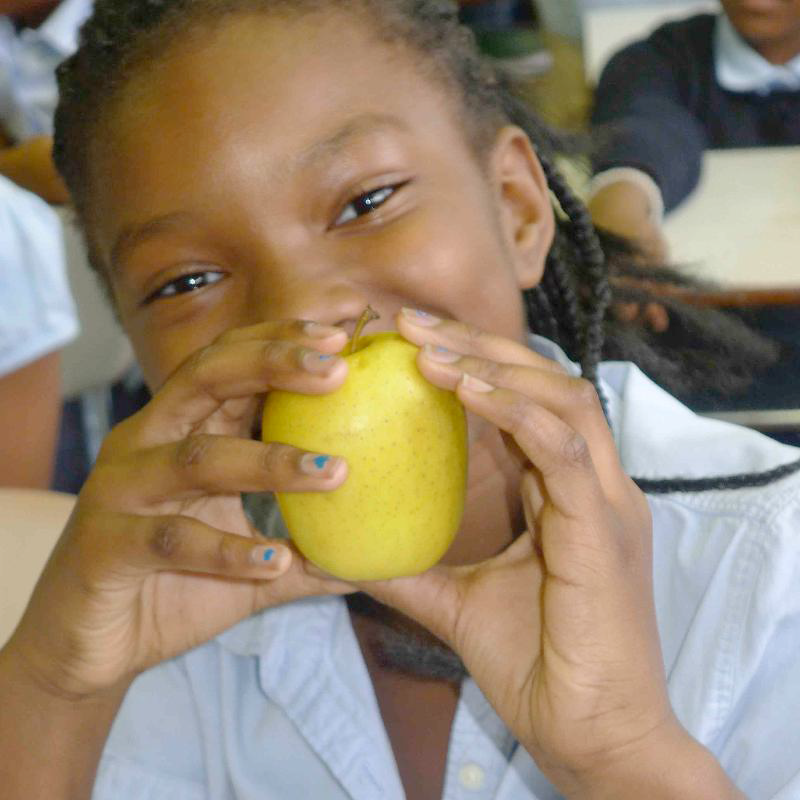 Our Hip2B Healthy Market Ambassadors in 2012 outscored students across their district and NYC in standardized tests! Do you think running a market, accounting, analyzing food labels to know what to sell, and writing letters and reading about food justice had anything to do with that? Or a great teacher? Wait! Did you see that 27% scored "4" in math! That is 27% scoring above grade level! Congrats to their teacher. Ms. Sara Ann Fearon. Yes, it's Hip2B Healthy. Register at PS221 and your child too can be a top NYC student. Hungry? Get your fruit on! 1 - 7 pm. All-natural ice cones, anyone? Who says you can't get a nutritious snack for as little as 50 cents? Students/parents - forget the junk food at the corner stores! Support youth promoting fresh food and your health in your neighborhood. Thursday market is at Hamilton Metz Park and Friday's is at Brower Park. Thank you, donors! 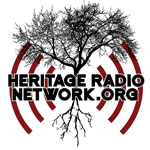 We're on Heritage Radio Network! Hear our kids tell you all about our how to run a business where youth empower their peers to eat well. We're on the radio, not once, but twice. Here is the on-site story. Here we are in the studio, featuring Tassia and Maria. Thank you, Heritage Radio Network. Adults? Want pick-up? A chance to win gift certificates for soccer restaurants and games? 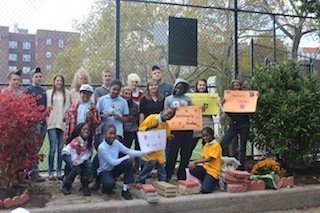 Students Help Students Build Gardens! Hip2B Healthy Schools don't waste any schooldays. That's why PS 221 second graders helped their friends at PS 161 build a garden the very last days of school in June. Thank you to New Design High School and Home Depot for their generous donations! Solid Rock Supports Hip2B Healthy Students! In June, a mission of youth and their parents from Florida, called Solid Rock, stormed into Crown Heights and helped Hip2B Healthy students build gardens, cook nutritiously with Chef Elle Siimone, make artful signage and play ball - all to get healthy. Hip2B Healthy Farmstand Fundraiser Rocked! Did you know PS 221 offers Metropolitan Opera Guild Urban Voices chorus, keyboard for all students k-2 and ballroom dancing for 5th graders? On March 22, our Hip2B Healthy ambassadors raised $ with our first farmstand fundraiser - selling grapes, fresh orange juice, apple cider, New York apples, grape tomatoes, Ronnybrook yogurt drinks, strawberries and plants grown by our very own PS 221 urban farmers! Thank you, Jetro Cash and Carry, Ronnybrook, Tree-licious Orchards, Wilklow Orchards, Beth's Farm Kitchen. Gardening and Math? Using a Green Room! 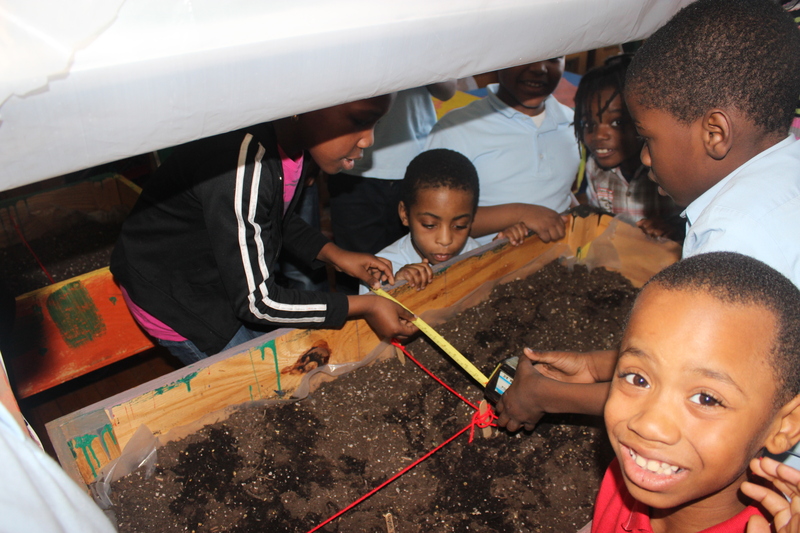 Our third graders were delighted to learn how to measure and boost their math skills by gardening in the Green Room! They used measuring to solve all types of planting problem, like where to plant seeds in the indoor grow tables. Thanks to the Whole Kids Foundation, Anna Elllis, teachers and students are growing in tables beautifully crafted by Home Depot and building worm composting bins. RAFFLE! Everybody wins! Win an iPod or earn prizes by selling tickets, including an iPod. Thank you, Kaboom, and Farmer Roy Hildebrant’s family and friends - our Crown Heights Farmers Market co-founders - for planting the first children’s garden at Hamilton Metz Park. We planted trees and bulbs. We look forward to seeing them come up this spring, to bring back our beautiful memories of Farmer Roy, who passed last August. See our slideshow of Chef Kehrli with his newest sous chefs. Many thanks to all our Tastes of Brooklyn and Eat Real NYC chefs and donors and volunteers and tasters! Special gratitude to the Aetna Foundation, Bronx Health Reach, Citizens Committee of New York City, Home Depot, Whole Foods Market and all our volunteers and supporters who keep Seeds in the Middle growing! Seeds in the Middle thanks these distinguished New Yorkers for joining our advisory board! David Appel, MD, director of Montefiore Medical Center's School Health Program, named by New York Magazine as one of New York's "influentials." Fern Gale Estrow, a Registered Dietitian and founder of The FGE Food and Nutrition Team, whose focus is improving health and quality of life through integration of programs affiliated with food, nutrition education, clinical support, media literacy, and/or policy development. Seeds in the Middle, named by fourth graders, inspires parents, educators, students and their community to access all opportunities beginning with improving their health, enhancing arts education and greening their environment. We are joyful, respectful, educational and engaging. We nurture the whole child. Our innovative strategy to fight obesity and combat health disparities initiates at schools. We weave proven programs into a comprehensive package to turn around ills driving down opportunity and advancement. We empower and educate all to get healthy and scale disparities. Our pilot Hip2B Healthy schools are in central Brooklyn, a neighborhood with one of New York City's highest obesity, diabetes, and heart disease rates. Our programs are models for replication. 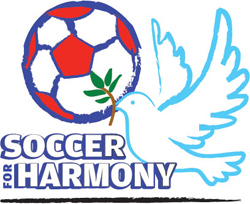 We have run community farmers markets and founded Soccer for Harmony tournaments, inspiring social change through soccer. We are proud to boast that our focus 4th grade class test scores in 2012 surpassed the citywide average! At Seeds in the Middle, we partner with faculty. We teach how to grow, market, access and prepare nutritious food, how to exercise and engage in the arts, all the elements needed to promote life-changing lifelong health. Our partners come from all walks of life: chefs, athletes, educators, artists, builders and more. We cross cultures. We transform gray into green, destitution into inspiration. Guest chefs, artisans, foodies! You can still sign on! Enjoy exquisite food and drink & support Hip2B Healthy kids. 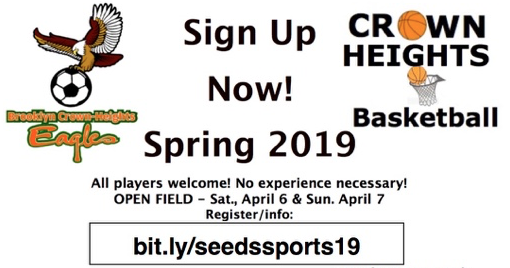 The season opens with free fun! SOCCER PICKUP IN BROOKLYN - ADULT PLAYERS! Join Crown Heights Pickup Soccer and support the kids! 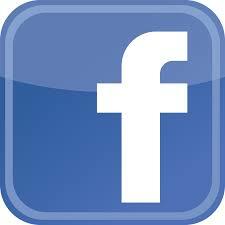 See photos of what we do on Facebook here! Did you see us in the Daily News? Check out their rap for their Hip2B Healthy Market. Learn more about Seeds in the Middle from Charity Sub! Sara Ann Fearon, Fourth Grade Teacher, in July 2011, teacher Sara-Ann Fearon wrote a moving letter about the deterioration in diet over two decades in Crown Heights and the “staggering” differences in services between their neighborhood and more affluent areas. She movingly describes the impact of Seeds in the Middle. “I am reminded of the saying, “Give a man a fish and you feed him for a day. Teach a man to fish and you feed him for a lifetime.” This project has created what we hope to be mental and physical adjustments that will continue throughout the lives of these children. It is also my desire to see the continuation of this program in P.S. 221 with its students becoming the ambassadors of healthy eating within their families and their communities." See entire letter here. See what we reported to the Aetna Foundation, our first grantor! good health to becoming active advocates for positive change. Read entire report here! Georgia Goldendoodle says get a pup a bone!